I felt like someone had rudely awoken me from a nice nap and looked around, irritated. I looked at the anesthesiologist staring back at me and realized, with a jolt, where I was and what had happened. The OB cheerfully said I was all done and they wheeled me back to recovery. 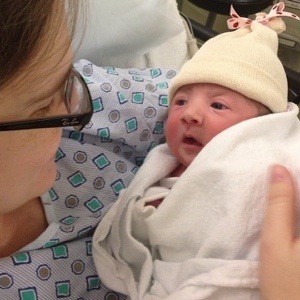 I was really looking forward to getting to hold my baby and nurse her for the first time. The nurse started fussing with me when I arrived in the recovery room. And I recall feeling sleepy and annoyed. “Where is my baby?,” I asked her. She looked at me like a deer in head lights. “You’re bleeding,” she said blankly. “From my incision?” I asked her. “No,” she answered distractedly as she started bustling about. “Internally?,” I guessed. “No!,” she said emphatically, as if I was intentionally bothering her with dumb questions. She yelled for the OB. He came in and inspected me. He murmured something to the nurse about clots and put on some very long gloves. He then did something that felt like he was plunging his hand through my incision and then yanking around all my internal organs. I found myself screaming in pain again and scaring another batch of poor women being prepped for their C sections. The nurse ameliorated the situation by plunging a gigantic needle into my thigh to stop the blood bath. The OB then smiled at me, and declared that all was well. I sobbed at him and found it difficult to agree. The nurse looked uncertainly at him, and he told her to pull out all the stops on my pain medication. That, at least, gave me some relief. My husband finally walked in, and stared bemused at all of the blood soaked rags and bed sheets all around me. The nurse started weighing them to determine how much blood I had lost to see if I would require blood. Apparently I did not, but just barely. I could tell by my husband’s face that he did not have good news. “She is having trouble breathing,” he said. “They are trying to figure out if she needs to go to the NICU.” “When will I see her?,” I asked desperately. “I don’t know.” He gave my hand a squeeze as the tears rolled down my face. Hours later, they finally brought her to me. I was desperate to see her, to nurse her. I knew once I got her in my arms, everything would be ok. My husband placed her in my arms and took a picture. I will always treasure it. She was looking right at me, as if in awe that she was finally seeing her mama for the first time. I looked in awe right back. Her breaths were coming in little grunts. The nurse refused to let me nurse her due to her breathing problems, so I just pulled down my hospital gown as much as I could and laid her on my chest. Her breathing evened out, and she fell right asleep. I could have laid like that forever, but much too soon they were wheeling her out again. They monitored her for about eight hours total. My husband never left her side. I waited alone in my hospital room, surrounded by my family, waiting with bated breath to see if she needed to be taken to the NICU. I asked my mother where my grandparents were. They were usually the first to come and the last to leave when our babies were born, and they were conspicuous by their absence. She told me they were at mass to pray for us. I felt more at peace. My husband finally came into the room with good news. Her oxygen levels were normal, and she wouldn’t have to go to the NICU. They would be bringing her shortly. “Can I nurse her?,” I asked desperately. He said I could. They brought her in, my sweet little bird. She latched right on and nursed like a champ. My grandparents strolled in, fresh from mass, and seemed completely unsurprised that all was well. We left the hospital a few days later with our sweet little bird. Scott had to run home to get the car seat because of course we hadn’t installed it yet when I went into labor. We had no idea where the newborn insert was, so her head jostled a bit. I also left the hospital in a long shirt with no pants because I hadn’t anticipated when I packed my hospital bag that the pants I was wearing would be soaked in amniotic fluid. Looking back on the whole experience, I have decided that scheduled Cs aren’t so disappointing after all. This entry was posted in Uncategorized and tagged baby, birth story, C section, daddy, delivery, mommy, NICU. Bookmark the permalink. I have a little Wren is is in 1st grade now. It’s been such a fabulous name for our “bird.” I love finding others with names…and love that they are a small set. I just love that name! I loved reading this. Another beautiful daughter born to one brave mama!